As I took my seat in the American Public Health Association Governing Council beside some of the most prominent leaders in public health last week, I felt a wave of anxiety and excitement come over me. The room was filled with tables assigned to the various sections of the APHA community. Our assigned table was behind the Executive Board, and we were facing the stage, where Executive Director Dr. Georges Benjamin sat before us. All of the long hours studying, researching, and practicing public health had paved the way for me to be the one of the first three students chosen to be a Governing Councilor on the legislative body of one of the largest and oldest public health associations in the world. I was elected by the members of the Student Assembly this spring based on my experience and goals for the two-year term, and I will be helping update and archive APHA policies throughout this year and the next. The primary role of the Governing Council is to vote on APHA policies and elect executive board members who focus mainly on the management and membership of the organization. APHA policies go through an extensive science and policy evaluation by the association’s Joint Policy Committee before they go on to serve as references for federal, state, and local lawmakers, as well as many organizations across the world. In many cases, APHA policies are directly cited, and the action steps they propose are used as framework for practice. By providing effective solutions to public health issues, our policies are important tools to ignite change and create healthier populations on a global scale. This year, the Governing Council passed 11 policies on public health concerns, including violence in law enforcement, raising the minimum wage, promoting transgender health, and holding the United Nations accountable for its role in the Haitian cholera epidemic. As a student, this experience pushed me to grow as a public health professional and gain several mentors. I now know the scrutiny that is necessary to achieve effective policies, and I’m more confident in my ability to share my expertise and promote an agenda, which seemed to fit with the mood in Denver. 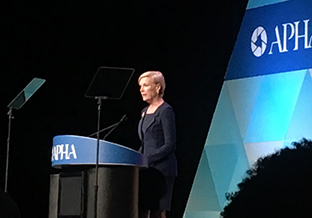 The theme of this year’s APHA conference was “Ensuring the Right to Health,” and the keynote speaker was Cecile Richards, president of Planned Parenthood Federation of America. On the first day of gathering, Richards spoke about the importance of young people taking action in public health—this make sense since the Student Assembly makes up the largest portion of APHA with over 6,000 members. However, even though public health students have historically played a large role in the organization, we have not had Governing Council representation until this year. The leaders in public health are beginning to recognize the importance of the student perspective and what we can contribute to improve the field of public health. As Richards mentioned, our generation is passionate about human rights and public health equity. We are determined to improve our society so that the next generation is healthier and more equitable than ours. 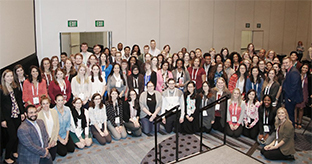 Since our generation is learning about the modern era of public health and recent advances, our voices on the Governing Council brought new perspectives to the APHA, and it’s crucial that the Student Assembly was able to speak and vote on these policies. We were able to provide our passion and burgeoning expertise, while also learning from leaders in the field. Though we are students now, we will be the leaders of public health in the future. Christina Olbrantz is a second year MPH student in the department of Environmental Health Sciences studying Climate and Health. She conducts research on tick-borne diseases and aims to work at the intersection of research and policy within public health.